After 80 years in hiding, the bat with which Babe Ruth slugged the first home run in the new Yankee Stadium on Opening Day, April 18, 1923, will be auctioned along with many other prized and valuable memorabilia as part of the event dubbed "The Babe Comes Home" -- A Celebration of New York Baseball. The auction, being organized by premier sports memorabilia auctioneer, SportsCards Plus, will be held Oct. 2-4 at the New York Marriott Marquis Hotel in Manhattan (1535 Broadway) in the Times Square ballroom. One of baseball's most prized pieces of memorabilia, the bat that The Babe used to hit the first home run in Yankee Stadium, will be part of the New York themed auction, which will also feature autographed game-used memorabilia and personal mementos from many of New York's other baseball legends including Mickey Mantle, Lou Gehrig, Joe DiMaggio and the personal collection of Brooklyn's Pee Wee Reese. The items will be on display on Saturday, Oct. 2 and Sunday, Oct. 3. The auction will be held on Monday, Oct. 4. "The Babe Ruth bat is the single greatest piece of sports memorabilia ever discovered," said David Kohler, President of SportsCards Plus. "Along with the bat, we are planning to have many incredible artifacts representing the rich history of baseball in New York as part of our 'Babe Comes Home' themed auction." 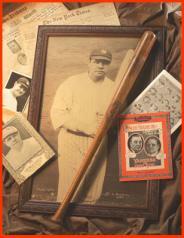 In addition to the historic bat, the auction will also include: Babe Ruth's personal shotgun and an accompanying signed photograph, a mint condition single signed Ruth baseball; the largest and finest known Ruth Signed Photograph from 1921 (27 1/2" x 37 1/2"); and The Babe's signed 1933 Last Will and Testament (from the Ruth estate). The auction will also offer dozens of items from the personal collection of legendary Brooklyn Dodgers Hall of Famer Pee Wee Reese, including game worn items, autographed pieces, his 1955 World Series and 1953 National League Championship rings, awards, photos, programs, contracts and more. Some of the other unique items up for auction will include: Mantle's First Major League Home Run baseball; Gehrig's signed 1936 Yankees Contract from his MVP season; DiMaggio's game used bat; the finest known 1927 Yankees team signed photograph; game ball from Don Larsen's Perfect Game in the 1956 World Series; a rare 1913 New York Giants team panoramic photo (with Mathewson, McGraw and Thorpe) and much more. After his 1923 home run, Ruth, always supportive of kids and young ball players, autographed the bat he used and donated it to the Los Angeles Evening Herald to be awarded as the top prize in a high school home run hitting contest. On the bat, The Babe inscribed, "To the Boy Home Run King of Los Angeles 'Babe' Ruth, N.Y. May 7, 1923." The bat was awarded to Victor Orsatti by the Los Angeles Herald in June 1923. It has remained in the Orsatti family for the past 80 years, until recently being presented to David Kohler, of SportsCards Plus, for auction. The buyer of the bat will also receive all of the accompanying documentation including a congratulatory telegram from The Babe, to Orsatti. "It is unanimous," said Kohler. "The authenticity, provenance and condition are beyond reproach. Virtually everyone who sees it is simply blown away, not only by the mere existence of the bat, but also by its incredible beauty. It has a definite aura about it. Since the bats discovery, its potential value has been a hotly debated topic." The Ruth bat is expected to join the Honus Wagner T-206 and Mark McGwire's 70th home run ball as the only other pieces of sports memorabilia to fetch over $1 million at auction, and some industry experts believe it could make sports memorabilia history as the most expensive single item ever sold. Anyone interested in adding similar, high-end New York baseball related items to this auction should contact SportsCards Plus at 800-350-2273. Founded in 1979, SportsCards Plus has become one of the largest dealers of vintage and historic sports memorabilia in the United States. Dealing in virtually every sport, SportsCards Plus carries one of the most diversified inventories of sports cards and memorabilia in the nation from the 1880s to the present. For more information, SportsCards Plus can be reached at 800-350-2273 or by visiting their website at www.sportscardsplus.com.